al meetings dedicated to research in embedded reactive systems involving the interplay between symbolic/discrete and continuous behaviors. Academic as well industrial researchers are invited to exchange information on the latest developments of applications and theoretical advancements in the analysis, control, optimization, and implementation of hybrid systems. HSCC conferences are held each year as a part of the Cyber Physical Systems Week (CPSWeek) which is the collocated cluster of four conferences: HSCC, RTAS (Real-Time and Embedded Technology and Applications Symposium), IPSN (International Conference on Information Processing in Sensor Networks), ICCPS (International Conference on Cyber-Physical Systems) and several workshops. Through CPSWeek, the four major events will have a shared registration process, joint invited speakers and poster sessions, and joint social events. The previous editions of HSCC were held in Berkeley, USA (1998), Nijmegen, The Netherlands (1999), Pittsburgh, USA (2000), Rome, Italy (2001), Palo Alto, USA (2002), Prague, Czech Republic (2003), Philadelphia, USA (2004), Zurich, Switzerland (2005), Santa Barbara, USA (2006), Pisa, Italy (2007), St. Louis, USA (2008), San Francisco, USA (2009), Stockholm, Sweden (2010), Chicago, USA (2011), Beijing, China (2012), Philadelphia, USA (2013), Berlin, Germany (2014), Seattle, USA (2015), Vienna, Austria (2016), Pittsburgh, USA (2017), and Porto, Portugal (2018). 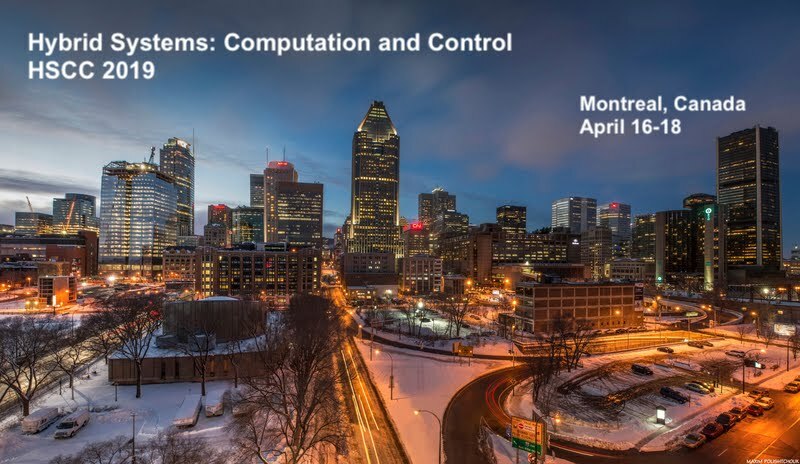 The upcoming edition will be HSCC 2019 in Montreal, Canada. Proceedings of past HSCC conferences are available through Springer-Verlag and the ACM Press. Past proceedings of HSCC are indexed on-line through the computer science publication database (DBLP). 2018: Antoine Girard. Reachability of uncertain linear systems using zonotopes. HSCC 2005. 2018: (BP) Daniel Gburek and Christel Baier. Bisimulations, logics, and trace distributions for stochastic systems with rewards. 2017: (BSP) Abraham Vinod, Baisravan Homchaudhuri and Meeko Oishi. Forward stochastic reachability analysis for uncontrolled linear systems using Fourier transforms. 2016: (BSP) Aditya Zutshi, Sriram Sankaranarayanan, Jyotirmoy V. Deshmukh and Xiaoqing Jin. Symbolic-Numeric Reachability Analysis of Closed-Loop Control Software. 2015: (BSP) Sam Coogan, Murat Arcak. Efficient finite abstraction of mixed monotone systems. 2014: (BSP) Ayonga Hereid, Shishir Kolathaya, Mikhail S. Jones, Johnathan Van Why, Jonathan W. Hurst, and Aaron D. Ames. Dynamic multi-domain bipedal walking with atrias through slip based human-inspired control. 2013: (BP) Michael Posa, Mark Tobenkin, and Russ Tedrake. Lyapunov analysis of rigid body systems with impacts and friction via sums-of-squares. 2013: (BSP) Hongfei Fu. Approximating acceptance probabilities of CTMC-paths on multi-clock deterministic timed automata. 2012: (BP) Rajeev Alur, Ashutosh Trivedi,and Dominik Wojtczak. Optimal Scheduling for Constant-Rate Multi-Mode System. Engineering Applications including automotive, communication networks, avionics, energy systems, transportation networks. Martin Franzle, University of Oldenburg, Germany. Paulo Tabuada, University of California Los Angeles, USA.